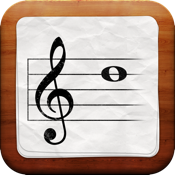 NoteRef is a handy app for people who are learning music. If you're studying a piece of music, and don't know all the notes on the staff by heart, you can tap the note and NoteRef will show you its name. It will also play the note, so you can hear that you've got the right one, and learn the sound that matches that note.